It has been a while since I uploaded my last recipe, so I really wanted to make something delicious. I always share with you the yummiest recipes because that’s what I love the most and I think they are the ones that you enjoy the most as well. However, I do not eat all of that all the time, as I also have some good stuff on a daily basis. For this reason, today I am going to show you one of my favourite healthy recipes and I hope you like it too. I found it in Niomi Smart’s book Eat Smart, which is a great recipe book full of healthy options. I knew I wanted to make some sort of snack and that I didn’t want an extremely difficult recipe, so I ended up choosing her Lemon Coconut Bliss Energy Balls. They are really easy to make and they are delicious too. 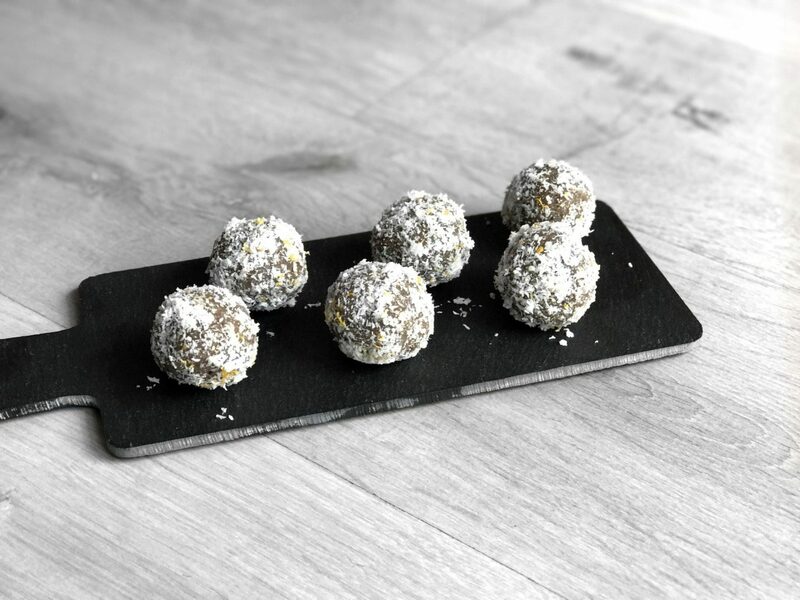 This recipe makes about ten of these balls, but you can double it up and make a whole bunch. Don’t worry about making too many, as you can keep them in an airtight container and put it in the fridge. You won’t need many ingredients to make them actually. 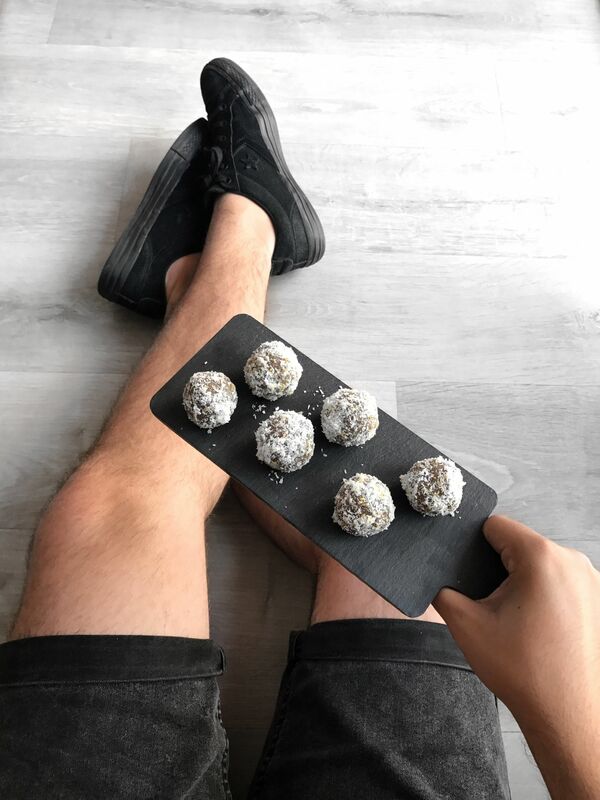 Basically, you will need 2 tbsp coconut oil, 90g desiccated coconut, 1 tbsp lemon zest, 80g unsalted nuts (the original recipe uses raw Brazil nuts, but I used the ones that I already had), 1 tsp vanilla extract or vanilla powder, 2 tbsp maple syrup and 3 tbsp lemon juice. You may have noticed that this recipe is vegan, however, mine weren’t because I had to use honey instead of maple syrup, as I had run out of it. If you want, you can also use agave. It’s up to you. The process is very simple and I am sure you won’t have any problem with it. You will need to blend together all the ingredients in a food processor, except the coconut oil, the lemon zest and 3-4 tablespoons of the desiccated coconut. Once everything is very well combined, you can add your coconut oil and blend it all again. You will end up with a kind of dense oily dough. Roll it into balls and put it in the fridge for 20 minutes. They do not need to be very big, just bite-size balls. Then, you need to sprinkle the desiccated coconut that we set aside and the lemon zest onto a plate and basically roll the balls over it till they’re fully covered. Once I had finished, I put them in the fridge again because I wasn’t going to eat them at that moment and because I like mine to be a bit cool, especially now that it’s quite hot. I don’t know how long they last because my family and I usually eat them quite quickly, but they definitely last for a few days or at least a week. However, I am sure they can last for longer. You definitely need to make them and try them. To be honest, you don’t have any excuses. They are delicious and very healthy, so why not? I normally have one or two as a snack in the morning so that I have more energy to be ready for the day. Let me know if you would like to see more healthy recipes from Eat Smart or anywhere else in the future. Obviously, don’t forget to let me know if you make them too. You can contact me on my social media as usual or even use #zoelhernandez when you upload a photo on Instagram. Wow that sounds delicious too!